Twelve Important Life Lessons - Make them a part of your life and start experiencing greater happiness! Everyone wants to be happy but few of us understand the thought processes that are necessary to experience happiness. I have studied this subject for over 35 years and can't wait to help you identify what is missing in your life now so you can quickly change things around and begin experiencing more positive feelings about yourself, the people in your life, and life in general. In simple language how to live a life worth living. By understanding what you control and what you are responsible for, readers will quickly identify what they need to change in their life to create more positive experiences. Each of the Twelve Life Lessons provides easy to understand mental strategies to change feelings of fear, guilt, and anger to feelings of excitement, contentment, and joy. The belief that the events in our lives determine the feelings we experience will be discussed and challenged. It will become clear to the reader why this belief has ruined and destroyed millions of lives. Readers will learn that the meanings we give to the events that occur in our lives are determined by our beliefs and responsible for our feelings. With easy to follow mental strategies, readers will learn how to give new meanings to their experiences by challenging and then changing their beliefs. Mastering this process will allow the reader to experience positive feelings regardless of what happens in life. Problems with relationships, child rearing, money, job satisfaction or the aging process can now all be addressed without fear that these events will cause serious mental breakdown and constant negative feelings. 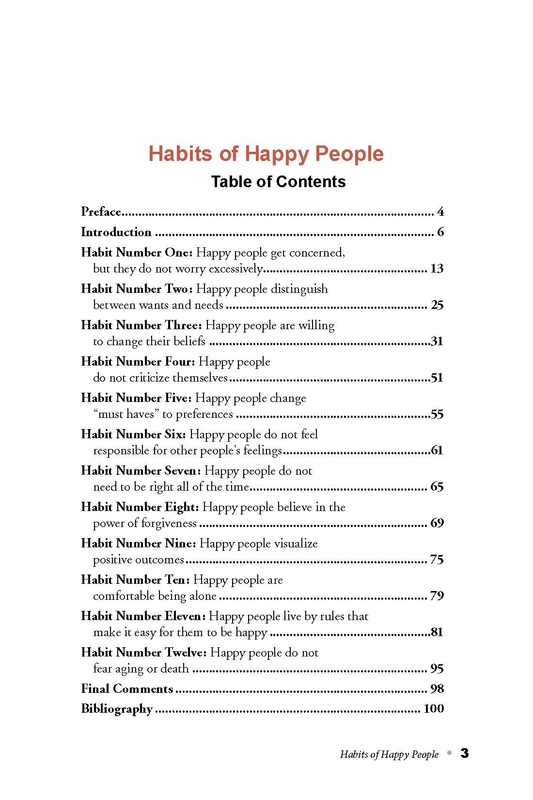 The Habits of Happy People will allow you to crawl out of the negative emotional tank and onto the solid ground of positive feelings and to a life worth living. Ideal for anyone seeking more happiness in his or her life. Thomas J. Slominski, MA, CCC-SLP, is a Speech-Language Pathologist who has been in private practice since 1972. Mr. Slominski is a nationally recognized expert regarding third-party documentation issues. For the past 15 years he has presented documentation seminars to SLPs and other healthcare professionals. Of the over 8,000 participants who have attended Mr. Slominski's seminars, 96% said they would recommend his seminar to a colleague. Also, Mr. Slominski is the author of Medicare Guidelines Explained for the SLP. Financial — Thomas Slominski is author of resource materials and online CE courses offered by Northern Speech Services; receives royalty payments. Financial — Thomas Slominski is Owner and President of Northern Speech Services; Ownership interests and receives salary. Nonfinancial — Thomas Slominski has no relevant nonfinancial relationships to disclose.